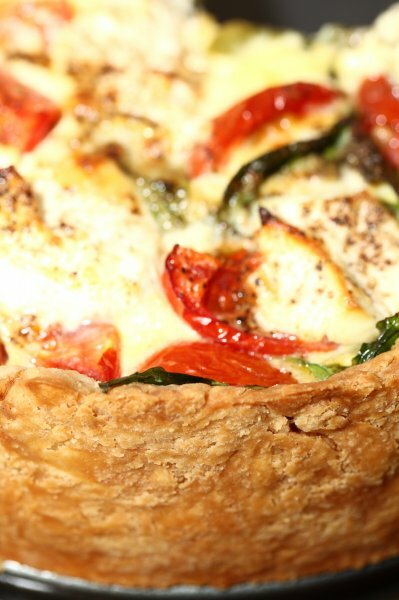 Quiche, tart or pie, this is our perfect marriage of cheese and vegetables, savoury custard in a golden crust! 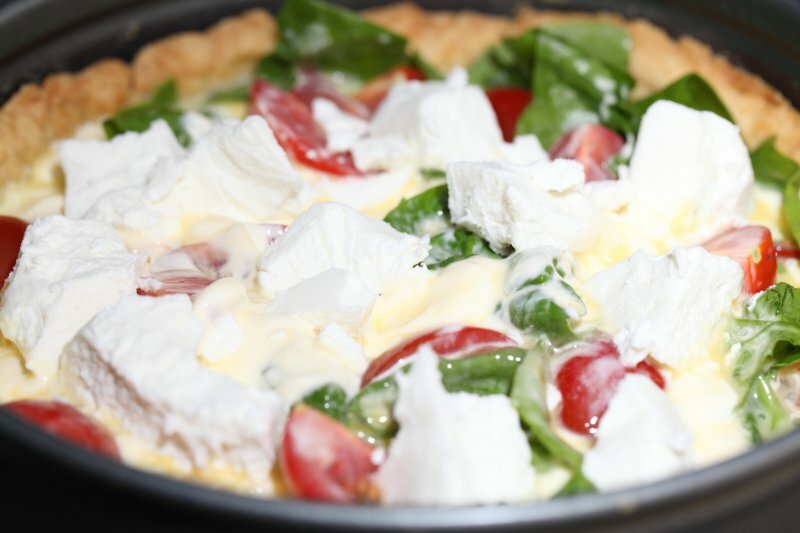 This quiche recipe originates from the ‘what’s left in the fridge’ idea, but it turned out a firm favorite! I always feel rather content if I can save leftover bits from their one way trip to the green bin. 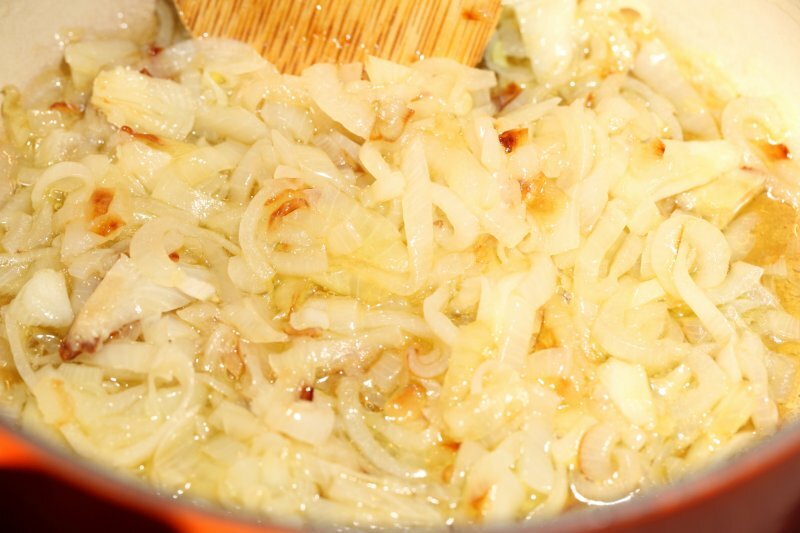 It is light and full of little flavor surprises: from the sweet onions on the bottom of the pie to the soft fresh goats cheese melted on top. 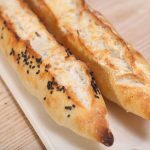 And no fatty puff pastry that’s not cooked on the bottom, but a nice golden crust pastry that you can very quickly and easily make yourself. Of course you can be as creative as you like with what’s left in your own fridge. We use a ‘springclip’ cake tin of 20 cm for this recipe. We Dutch people also use these tins for apple pie. 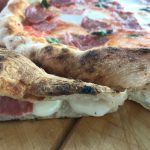 With the amounts given in this recipe and our 20 cm tin we are always left with a little bit of dough, so you can also opt for a 22 cm tin. You can just fill it with a bit more spinach. 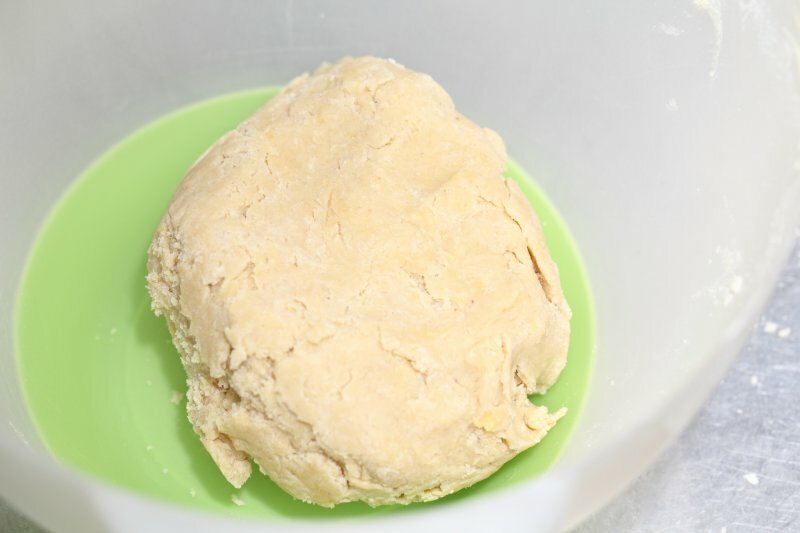 For the pastry dough combine 250 grams sifted flour with a pinch of salt and 150 grams of cold butter in small cubes, and rub with your fingers until you have a consistency resembling breadcrumbs. 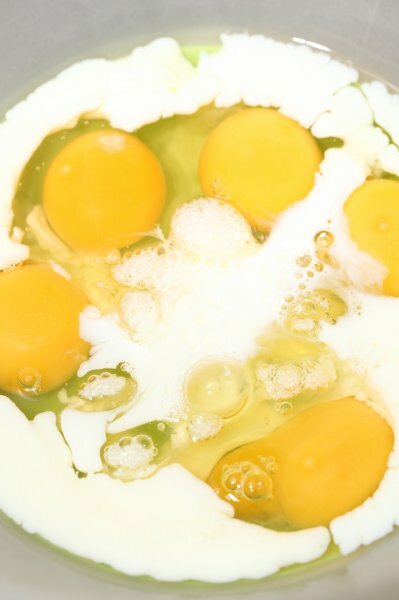 Add one beaten egg and stir with a knife, then quickly bring everything together with your hands and form a ball. 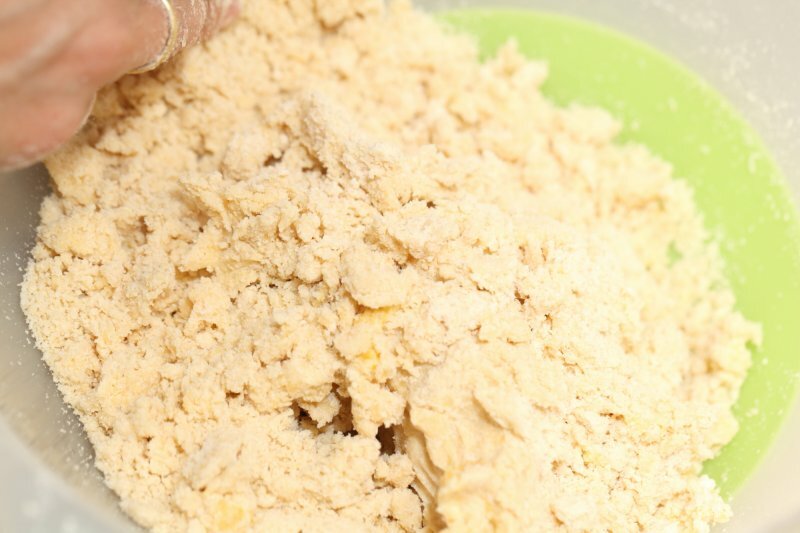 Or you can make your dough in a food processor. 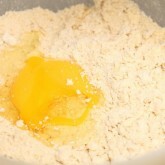 Pulse the flour, salt and butter in your food processor until the mixture resembles breadcrumbs. 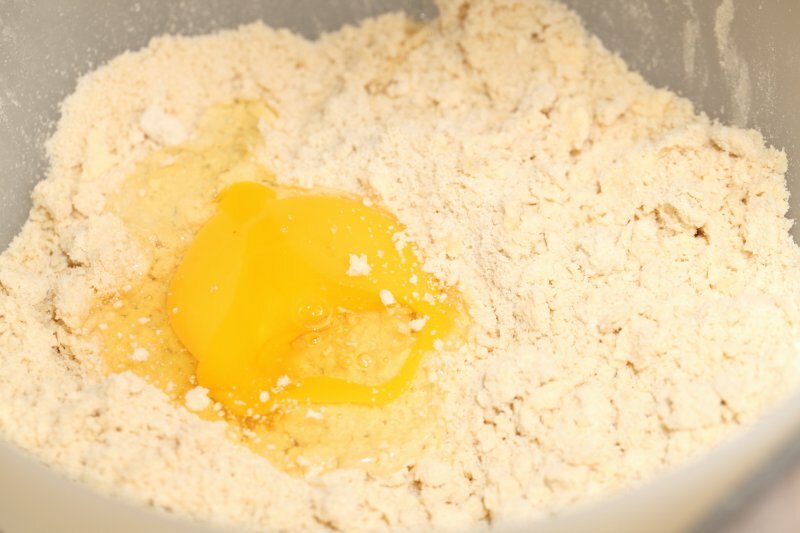 With the motor running, add the beaten egg until the mixture only just comes together as a dough. Roll the dough into a ball. 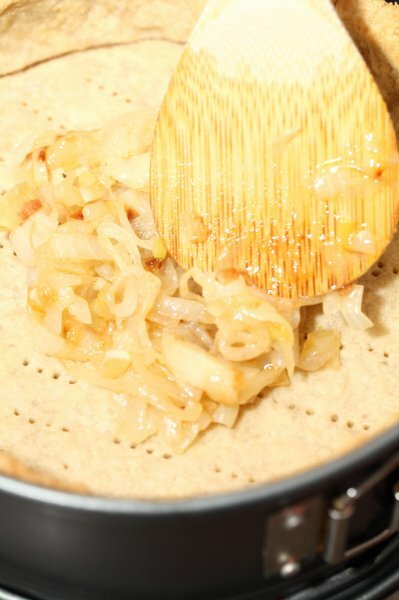 Wrap it in cling film and flatten the ball into a disc shape. Chill in the fridge for 30 minutes. 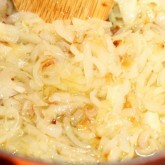 Finely chop a large sweet onion and fry in some olive oil for 10 minutes over low heat until soft and golden. 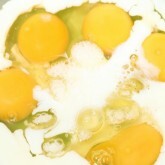 Beat 5 eggs together with the 100 ml milk and salt and pepper. 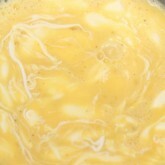 Whisk in the crème fraîche, there may occur small lumps, you can just leave them, it will be fine. Halve or quarter the tomatoes, depending on their size and your own preference. Crumble the goats cheese into small pieces. Wash the spinach and shake dry. Remove the hard veins from the leafs and tear the spinach leafs into smaller pieces. Will there be anything left for tomorrow? 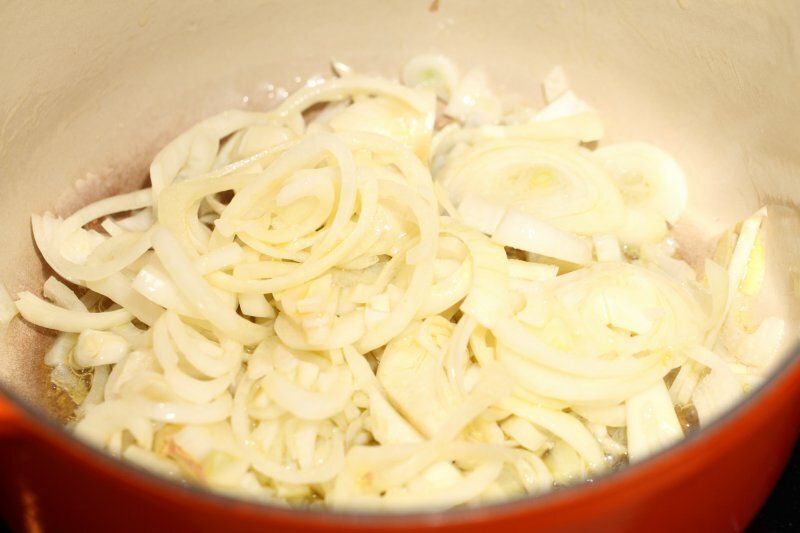 Preheat the oven to 200ºC / 390ºF. 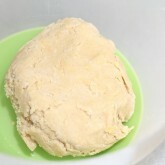 Roll out the dough on a floured surface and turn it regularly. 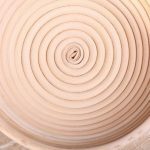 When you have a nice round disk, big enough for a raised edge, place the rolling pin under the upper portion of the dough, so you can easily lift it up and put it in the tin. 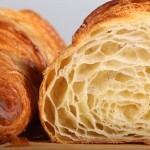 (or, to make life easier, you can roll the dough between two sheets of plastic wrap). Bake the pastry blind for 20 minutes, remove paper and baking beans and bake for another 5 minutes. 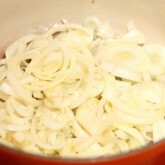 Cover the base of the pastry with the onions. Then add as many pieces of spinach as you can without going over the edge of the pastry. 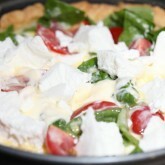 Now add the egg mixture, then gently the tomatoes and goats cheese. 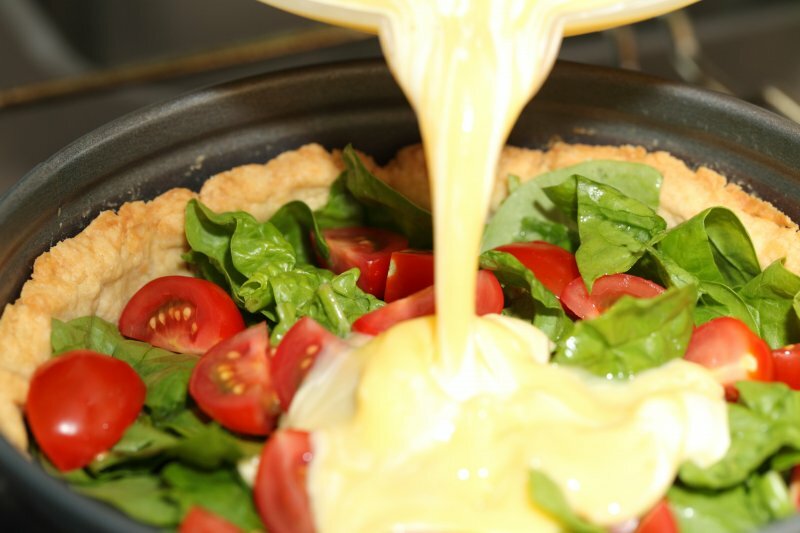 Carefully place the quiche in the oven. 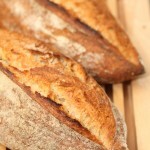 Bake for 35 to 40 minutes. Check after 25 minutes if you should temper the oven, as every oven is different. 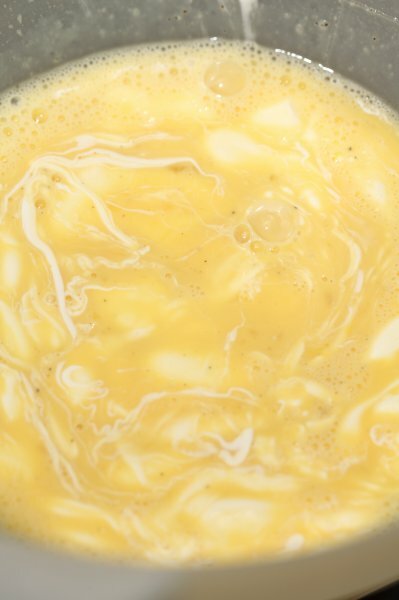 The filling should be set but only just, there should still be a bit of a custard wobble. 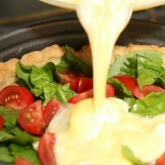 Let the quiche cool and set for another 15 minutes before you serve. 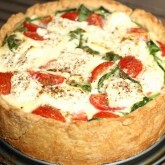 You will find that, (slightly warmed in the oven) this quiche is still very tasty the day after! 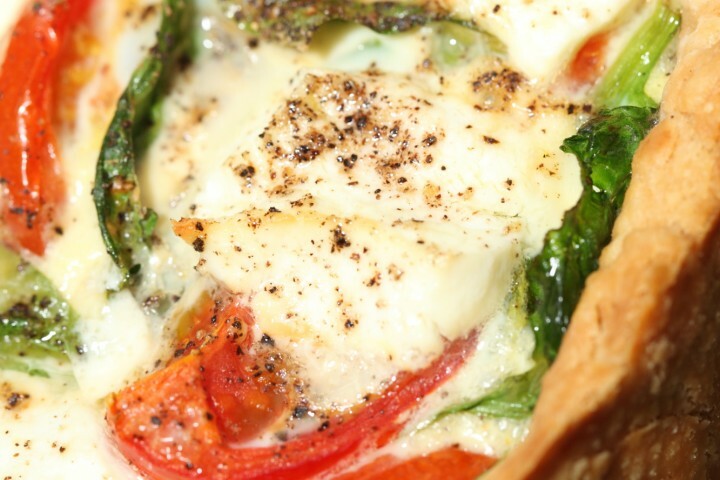 What’s your favorite quiche or veggie pie? 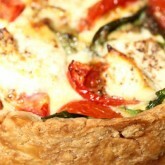 I made this quiche with spelt flour and it was delicious! Will have to adjust the oven temperature next time because the pastry browned a little too much during the blind baking – trial and error. Your recipes are so good and I love trying them out! 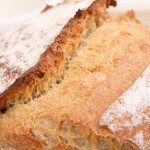 A very good suggestion to make the pastry with spelt flour. Great to hear it worked well. And than YOU again for trying and liking our recipe! 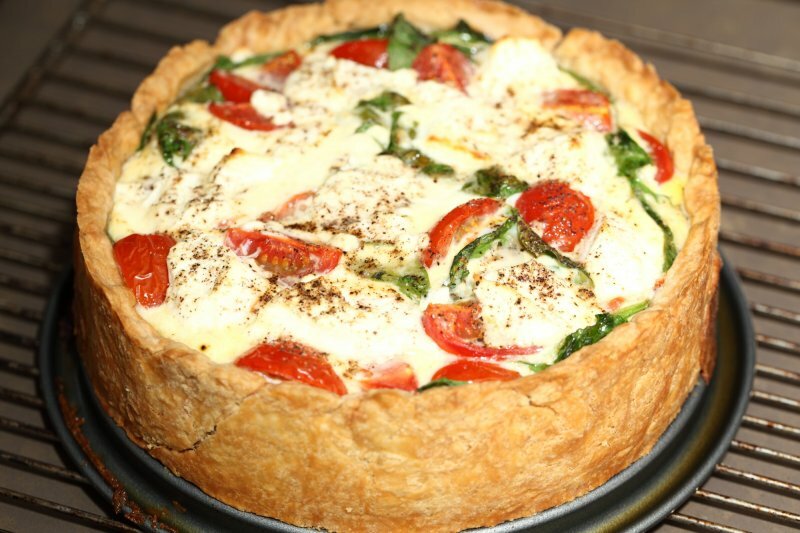 What a beautiful quiche. It will make a perfect lunch tomorrow. Thanks! Right back at ya for your stunning Aussie Apple Tart!